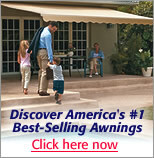 Also for RV's, Football Games, Vacation Homes, Campgrounds, Races, Marine Installations, etc! Because it can be removed easily from the ground sleeve, you can lower your SunSetter Telescoping Flagpole and move it to a different sleeve (at a summer house, for example) or take it inside when you are away from home. Better yet, take it with you! 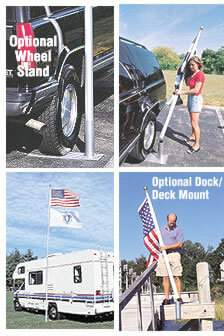 All you need is our optional Wheel Stand and you can take your flagpole anywhere. Proudly display up to two flags at football games, outdoor concerts, auto races, county and state fairs -- anywhere you want. If you own an RV, the SunSetter Flagpole and a Wheel Stand are all you need to "take your colors on the road" and display them at campgrounds or anywhere you go. If you like to take your flag on vacation, or if you have a place on a river, bay, or lake with a dock, our optional Dock/Deck Mount lets you install your SunSetter Telescoping Flagpole on almost any vertical surface. 184 Charles Street, Malden, MA 02148.